When the Danish national team steps on to the big stage in Russia this summer, the player's will be wearing shirts inspired by other red and white heroes: the Danish Royal Guard. Check out Denmark's home, away and goalkeeper shirts right here. After wearing adidas in the two last big tournaments where Denmark participated, it's again Danish brand hummel who designs Denmark's kits. Just like the shirt used in the qualification phase showing Danish hero "Holger Danske", the inspiration for the World Cup kit comes from another great Danish symbol: the Royal Guard. The inspiration from the Royal Guard can be seen on the subtle X on the front of the shirt. An awesome detail that makes this kit special to the Danes. If you look closer at the details around the neck, sleeves and shorts, it's hard not to notice that the blue colour plays a significant part in Denmark's new shirts. You know that the Danish Royal Guard wear blue pants, which rounds of the story perfectly. But actually, the blue colour has played a big part in former Danish national kits, even though you'd normally connect Denmark with the white and red colour combo. ”The blue details have been part of the most famous Danish national team shirts throughout the time. There was blue on the shirt for Euro 1984, there was blue on the shirt of the World Cup in Mexico and there was blue on the shirt when we won the Euro in 1992. So in that way, the blue colour is also a small reminder of some of the biggest moment's in Danish football history," explains hummel director Allan Vad Nielsen. At Unisport HQ, we're loving the blue details that provide the ultra clean shirt with a beautiful touch and different look than the latest Denmark shirts. 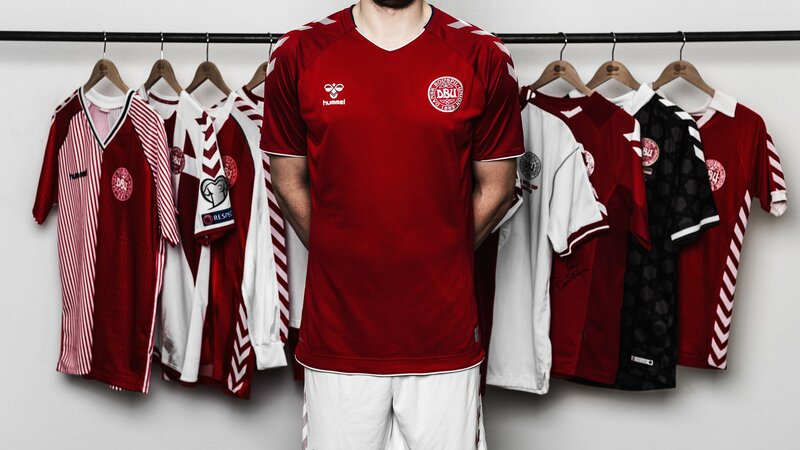 It's not only the Royal Guard and former kits that have been the inspiration for the Danish World Cup shirts. hummel met with Denmark profiles Christian Eriksen, Kasper Schmeichel, Simon Kjær and William Kvist before they started to design the shirt. In that way, the Danish player's had the opportunity to decide how they wanted the World Cup kits to look. Denmark's World Cup shirt will get its debut in the test game against Sweden on the 2nd of June, and you can already get your Denmark kit right here. Below you can also see the three different Denmark goalkeeper shirts which Schmeichel may wear in Russia this summer. And of course you can get them all at Unisportstore.com as well.